Do you need a Proactive Business Strategist? The role of the Virtual CIO is relatively new to small and mid-market businesses. The primary focus for this role is on strategy. Companies with larger budgets employ a full-time Chief Information Officer (CIO). 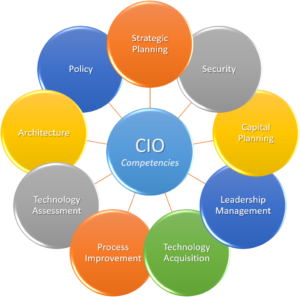 The Virtual CIO is for organizations with budget limitations who still require the 9 competencies of a CIO with a strategic and innovative mindset. Most mid-market companies employ an IT manager to run the day-to-day operations of the IT department. What is needed above that role is a Senior Technology Advisor or a Proactive Business Strategist that can review the organizations objectives, align the necessary elements in IT to the business, and keep the team focused on the strategic and tactical maneuvers that stabilize the company in a successful innovative state. The 8th Focus Area for a Virtual CIO? Wait... there's more! The 8th focus area for a Virtual CIO is directed at business outcomes. They will work directly with the senior leadership team in understanding the business's objectives, goals, and expected yearly outcomes. Including your Virtual CIO in strategic discussions and Board involvement is vital to the success of any organization. The Virtual CIO is not a senior technology specialist (a.k.a. the smartest technology professional in the organization). Simply understanding your IT department's strengths & weaknesses is not enough to help the organization maintain the competitive advantage that the other departments are working feverishly to achieve. This gap between senior management and Information Technology is where a Virtual CIO excels in providing exceptional value.